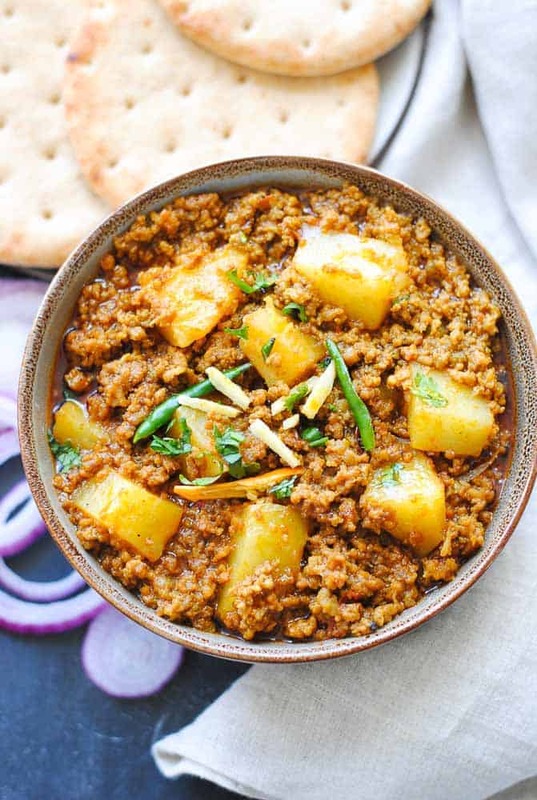 Keema aloo is a happy coming together of lamb or beef mince, cubed potatoes and of course onions and tomatoes. Heavenly when eaten with roti or rice! In the mood for a quick, filling meal? 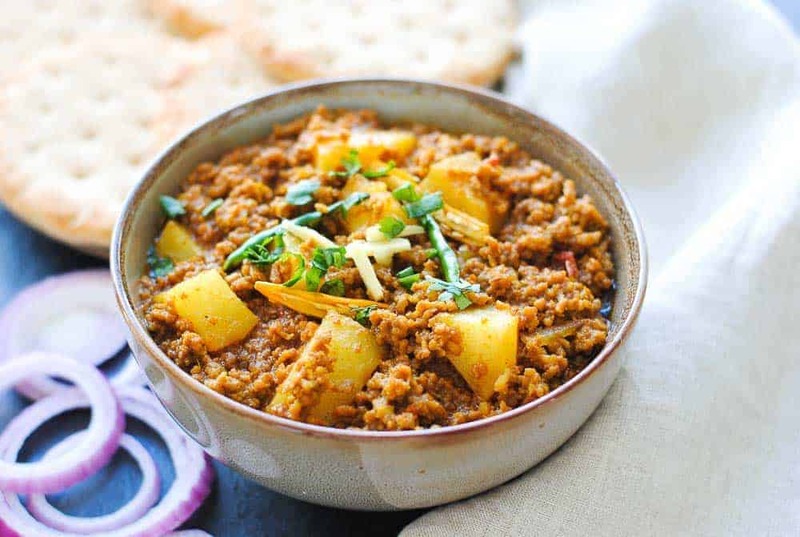 Make some keema aloo, spread it on a roti, roll it up and voila! You have an appetizing keema wrap ready to go. Reminds me of my school days when a keema wrap or two for lunch break kept hunger at bay. Nowadays, I like having it with naan bread and a quick salad of onions, capsicum, lettuce and cucumbers. And it tastes equally good with rice. 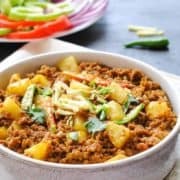 Just mix some keema aloo with plain rice and taste the magic. The beauty of mince is that it does not take ages to make and there are endless variations possible with it, all equally appealing. Don’t have potatoes? Substitute with sweet peas. Mince with sweet peas is a rather traditional recipe called keema mutter and it is just as tasty. In fact, you can cook mince with pretty much any vegetable at hand. I have experimented with sweet corn, mushrooms, capsicum and even okra with excellent results. Whichever vegetable you are using, toss it into the cooking mince in the last 5 minutes and you’re done. Just remember to chop the veggie of your choice into small cubes for faster cooking, and if you’re using okra, slice it lengthwise. Keema aloo is a happy coming together of lamb mince, cubed potatoes and of course onions and tomatoes! Heavenly when eaten with roti or rice. Heat the oil in a pan and put the cumin in it. Add the sliced onions and cook until they turn brown. Stir in the ginger-garlic paste, powdered spices and salt. Sauté for 2 minutes, add splashes of water to prevent the masala from sticking to the pan, and cook until it becomes a thick, shiny paste. (approx. 7-8 minutes). Add the mince and mix it together with the masala. Sauté for 5 minutes on medium heat. Add half a glass of water, cover and simmer for 10-12 minutes. Take off the lid and add the potatoes. Add more water if necessary. Cook for another 10-12 minutes. When all the water has evaporated, keema aloo is done. If you don’t have ginger-garlic paste, just chop the stuff (1 tbsp finely chopped garlic and 1 tbsp finely chopped ginger). Chopped ginger-garlic tastes just as good. For even better tasting mince, add a small, finely chopped onion (omelette style) along with the potatoes. The onion will turn translucent very quickly and look and taste great. 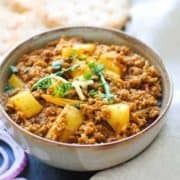 Did you make keema aloo? Don’t forget to give it a star rating below!